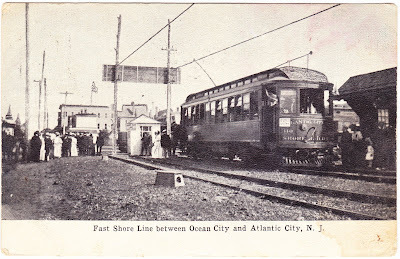 "The Shore Fast Line was a line of fast trolley cars running from Atlantic City, New Jersey, to Ocean City, New Jersey, by way of the mainland communities of Pleasantville, Northfield, Linwood and Somers Point. The line ran from 1907 until 1948. 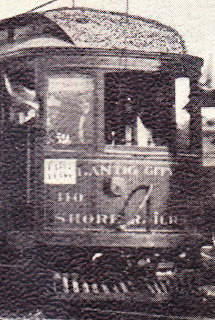 The company that operated the Shore Fast Line was called Atlantic City and Shore Railroad." More history on this trolley line can be found in Mervin E. Borgnis' 1979 book "We Had a Shore Fast Line." ATLANTIC CITY, March 1. -- Pennsylvania Railroad capital is back of a plan to link all resorts on the Jersey Coast from Sandy Hook to Cape May by trolley. 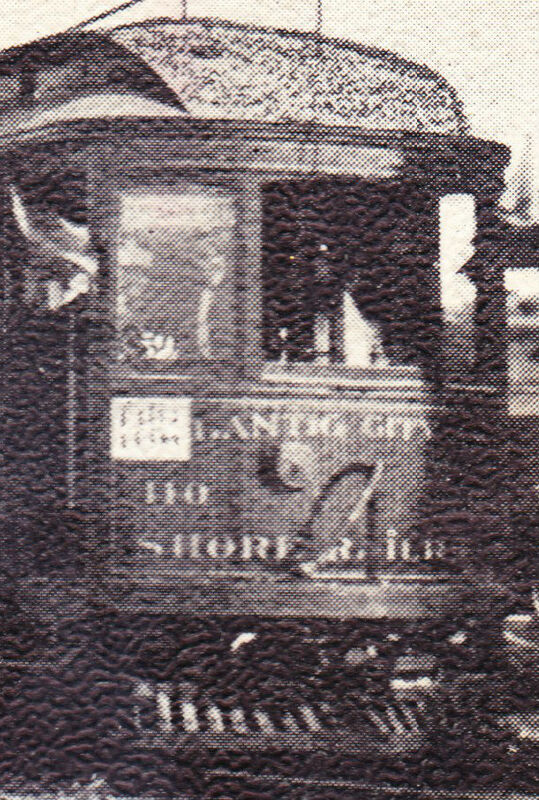 Railroad engineers assert that within three years it will be possible to go from New York to Sandy Hook by steamer and ride without change of cars to the southernmost point of New Jersey. 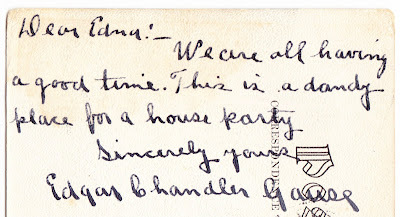 So, my ancestors had more house parties than I do. 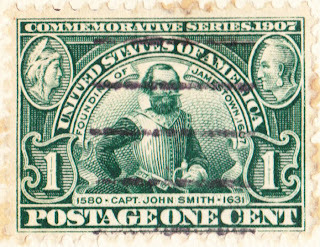 Finally, the 1¢ stamp on this postcard features Captain John Smith. 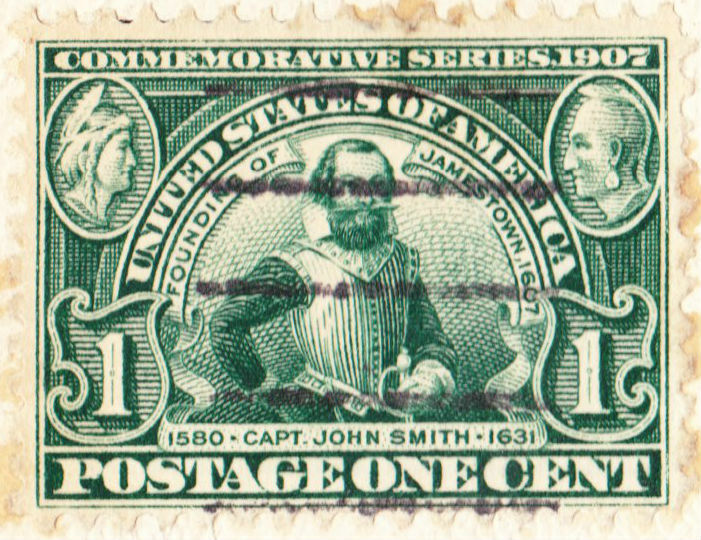 It was one of the Jamestown Exposition stamps of 1907, a commemorative set for a world fair that was held that year. According to 1847usa.com, this stamp is exceptionally difficult to find well-centered. For more information, check out the website's article titled "Postage Stamps of the United States First Issued in 1907." 1. One day later, on September 4, 1907, composer Edvard Grieg went to the big Hall of the Mountain King in the sky. 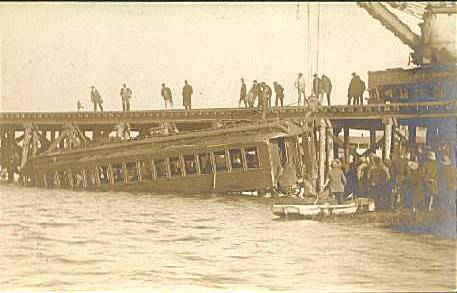 "The accident resulted in what is regarded as the first press release when public relations expert Ivy Lee, working with the Pennsylvania Railroad, parent company of the West Jersey and Seashore Railroad, convinced the company to present a statement to journalists at the scene of the accident. The New York Times printed the release word-for-word on October 30, 1906." 3. Now, the people who know my own fondness for the word "dandy" will understand that it's in my family blood. I clearly cannot help it.